The Lower Columbia Fish Enhancement Group currently maintains two riparian nursery sites, with a third site planned for the winter of 2015. At our primary nursery we containerize bare root stock, or grow plants from cuttings collected at or near our project sites. This nursery hosts between 12 and 17 species of riparian plants, depending on the type of projects we are currently managing. Our other two nurseries—at Hudson Bay and Toutle Lake High Schools—double as education programs. We are able to give students a hands-on experience that teaches them about the importance of water quality and keystone species like salmon. Our program produces about twenty thousand native plants annually! We manage projects in unique areas, from the Toutle River’s broad, sandy floodplain to Woodward Creek’s boulders and cobble, and we focus on using local plant stock wherever possible to maximize local adaptations. 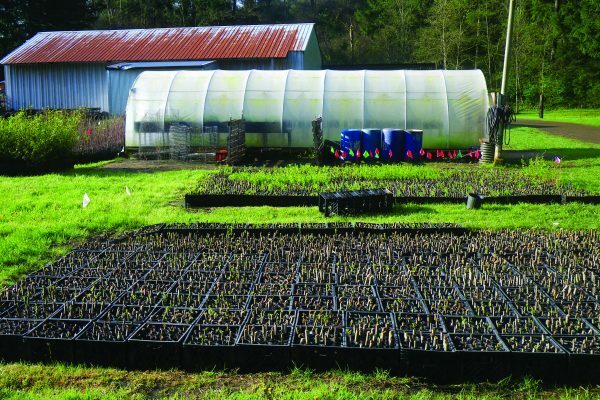 Our riparian plantings must be adjusted to the parameters of the site we are working in; managing our own nursery gives us the flexibility to practice adaptive management. The mission of Lower Columbia Fish Enhancement Group (LCFEG) is to lead the process of salmon recovery in a way that ensures community involvement in habitat restoration so that abundant, naturally self-sustaining salmon and steelhead runs occur throughout the Lower Columbia River region.